Not all moments in the trial of former I.G. Farben officials are serious ones for the defendants. 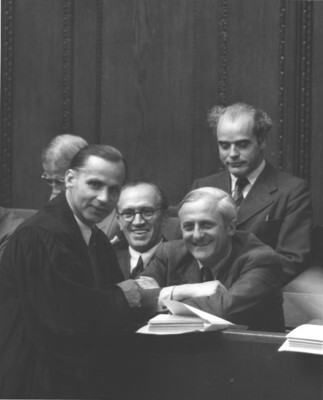 Here defendant OTTO AMBROS, production chief for buna and poison gas, is shown in conference with his lawyer, DR. FRITZ DRISCHEL of Freiburg, during a recess period in court. Wearing glasses is defendant CHRISTIAN SCHNEIDER backed by WALTER DUERFELD.